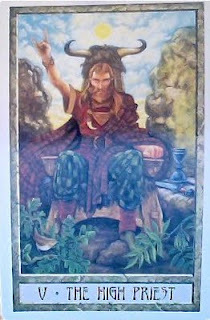 Today's Draw: The High Priest from the Druidcraft Tarot. Are your inner and outer lives aligned? How do you think you're doing on your quest for personal and/or spiritual enlightenment? Could your assumptions about what enlightenment is be holding you back on your path? We get this guy a lot. 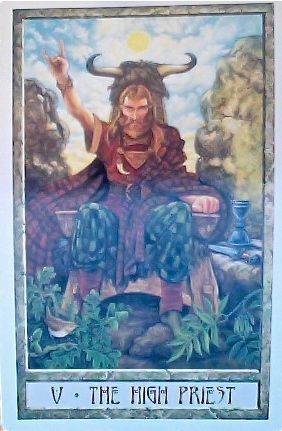 He's the Hierophant, the dude that teaches religious rules and laws and expects us to conform to them. In a reading, he might even foretell a wedding. And he'd be the one to officiate it. But as the book indicates, he can also come to suggest a different kind of marriage—the marriage of our inner and outer lives. What it all comes down to is living authentically. It sounds so simple, but it's not is it? I've had those words floating around in my head for years and I can't honestly say if I live authentically. I mean, I think I do. I pretty intrepidly follow the interests, opinions and attitudes that feel true to me, sometimes to the disappointment of others. And I've been told by people that I know myself pretty well. I suppose in many ways, I probably integrate my inner Tierney with my outer Tierney better than many. I have nothing to be ashamed of, no regrets, no reason to hide. But the thing is, people are constantly changing. Just like in a regular marriage. It's not like we can say, "I have now married my inner and outer selves and am done". Nor can we always be guaranteed to make choices that align both inner and outer selves. Part of figuring out who you are is trying on different directions and seeing what feels right. I mean, I know I'm all about the chocolate ice cream. But maybe I'm REALLY all about the pistachio and I just don't know it because I haven't tried it. And tastes change over time. I didn't used to like the color red and now it's a prominent color in my home. So it stands to reason the state of alignment between inner and outer selves is constantly in flux. Now this doesn't give ourselves a convenient excuse to keep living a lie or avoid exploring our inner beings. I mean, trying pistachio and liking it more could be authentic to me, after all. But what I'm trying to say is that these phrases that are bandied about—living authentically, marrying our inner and outer lives, knowing ourselves, being true to ourselves—they're not the holy grails we think they are. And the people who seem to have attained them, are really just as much in flux as you. Sure, there are different degrees of "being there". But being there 100% just doesn't exist. And we tend to torture ourselves with one of many conclusions....we're not doing it right and someone else is, we are "less than" the people who appear to be doing it right, we'll never do it well enough, we've failed at doing it, or it's fruitless for us to even try because we'll never do it perfectly. The same is true about the holy grails of happiness, inner peace, enlightenment and many other spiritual concepts. When we compare ourselves to another person's state of being or some other ideal, we set ourselves up for loss every time. None of these are destinations. Instead, they're points along a path. And the points get closer together the further you travel down the path, but you never reach the end of the path. Personally, I think the concept that there is a destination we must all reach and that we are measured by where we are on the route, is one of the most harmful thoughts to carry on the way to personal and spiritual enlightenment. It holds you back. You can't compare yourself to others, because you simply have no way of knowing what's going on inside them and you can't be objective comparing anything to yourself. And you can't judge by where you are on the path, because you have no idea where you on the path. I've experienced months of extreme peace and happiness, then dove over the edge into chaotic thought and depression. I was still traveling forward on the path, but depending on when you asked me, I'd give a very different report as to where I was on it. What I guess this is all getting to on this Tuesday early in August is this—you're doing fine. Keep up the good work. Don't ever give up trying. And, instead of critiquing and comparing, give yourself a break. You may just find yourself getting a glimpse of those holy grails more often.